Hi, I am interested in your 1980 Jeep Cherokee (stock #CTP2378.1) listed on Autotrader for $19,900. I'd like to get more information about this vehicle and confirm its availability. Worldwide Vintage Autos is pleased to present this 1980 Jeep Cherokee. One family owned California 4x4 since new. Garaged and babied. The Jeep Cherokee is a line of American vehicles sold by Jeepunder various vehicle classes. 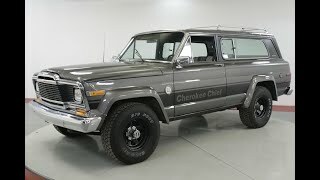 Originally sold as a variant of the popular Jeep Wagoneer, the Cherokee has evolved from a full-size SUV to one of the first compact SUVs and eventually into its current incarnation as a crossover SUV. The nameplate has been in continuous use in some form since 1974 and also spawned Jeeps most successful vehicle, the Jeep Grand Cherokee, which was originally slated to be part of the Cherokees lineup. The vehicle is named after the Cherokee tribe of North American Indians.